The key to making delicious and nutritious homemade jerky is a good dehydrator. In this article, I will share the best jerky dehydrator for first-time users, large families, and the jerky lover. Why make your own jerky? Jerky (“dried, salted meat”) is the best option for people who love to eat meat for protein minus the fat. This lean meat is trimmed of fat, cut into strips, and salted and dried for preservation. You can readily purchase jerky in the supermarket but this packaged product usually consists of highly processed meat. They contain more fat, additives and chemical preservatives plus they are expensive. You can make your own jerky using whole muscle meat and a good dehydrator. By making your own jerky, you can avoid unwanted ingredients and save on cost. Here is the best food dehydrator beef jerky list. In this list, I compared three of the best jerky dehydrators and what I like about them. These are great for homemade jerky and can be purchased on Amazon. 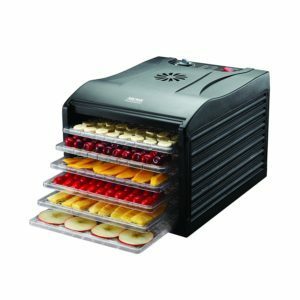 If you are looking for commercial dehydrators, you should also check out our list of the best commercial dehydrator for fruit and jerky. If you want a new cutting board for the final jerky, here’s a great list of the best cutting boards. What I like about it: The Nesco Snackmaster Pro Food Dehydrator quickly dries everything from apples to chicken jerky dog treats to beef. It lives to its promise of drying most type of food in between 6 to 18 hours, while others take days. If you dry beef, turkey and chicken meat – this quick drying time will make a difference. You can also dry various foods simultaneously as flavors don’t mix and the trays are plenty. Those who use this product also mentioned that it produces the best tasting dehydrated food. In fact they said that you will regret purchasing commercial jerky before. No wonder this is the #1 bestseller in Amazon’s best food dehydrator beef jerky list! The affordable price and powerful performance makes this product the best jerky dehydrator for first-time users. If you’re thinking about making jerky, give the Nesco Snackmaster Pro Food Dehydrator a try! 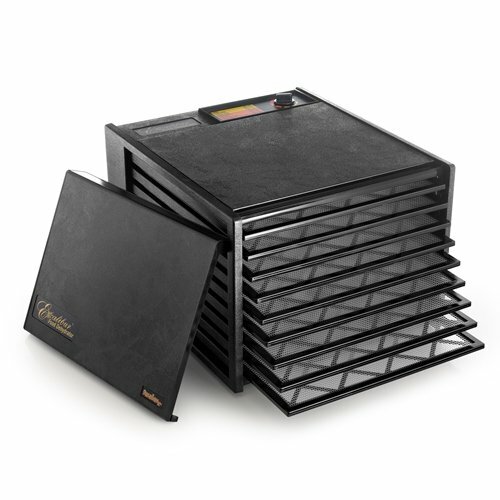 What I like about it: The square-shaped Excalibur Deluxe Dehydrator provides plenty of drying space for your goods, making it great for large families. It also has 9 trays, so it’s easier for you to dry anything in bulk. Perhaps the best thing that I like about this dehydrator is its temperature fluctuating technology. It keeps temperature low enough to keep the enzymes active while keeping the air temperature high enough to effectively dry your food. You can dry finely chopped meat to large cuts using the Excalibur. If you don’t like round dehydrators, then the square Excalibur Dehydrator is for you. What I like about it: If you want a square dehydrator for a good price, then the Aroma Housewares Professional Food Dehydrator is the best jerky dehydrator for you. It costs less than the Excalibur, but also dries the food well. While the Excalibur has nine trays, this Aroma Housewares dehydrator only has six. This is already enough for a small family. While this professional food dehydrator is devoid of bells and whistles, it comes with the necessary basics such as adjustable thermostat and adjustable trays. Give this meat dehydrator a try! 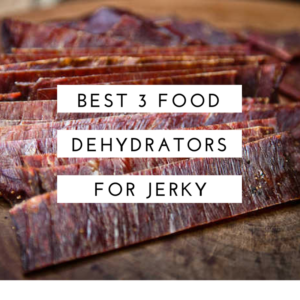 Love our best jerky dehydrator list? 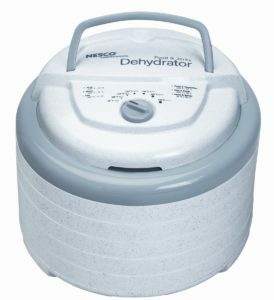 You might also want to read our Best 3 BPA Free Food Dehydrators.